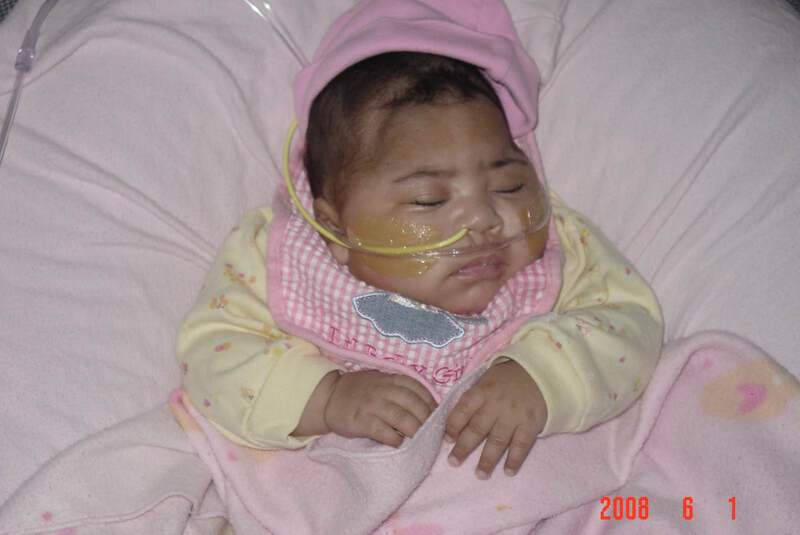 Gabrielle was born at 35 weeks due to ruptured membranes. She was born a healthy beautiful girl at 4 lbs. 10 oz. and scored a 9/9 on apgars. She was released home after 36 hours. She was born via C-section. I was negative on my screening but was treated with antibotics 8 hours prior to delivery. At 25 days old Gabby started grunting, refusing to eat, and was very sleepy and cold. I took her to the local hospital where they diagnosed her with late-onset GBS. She was intubated for 2 weeks and sedated during that time. She was on 4 different antibotics, had 3 spinal taps, and tons more tests. She ended up spending 10 weeks in the hospital before her release home. Since she has been home she has been doing great. She is at a daycare all day where she gets all her therapy and they just love her there. I thank God everyday that He has given us the opportunity to be with her everyday. Since this picture she now has a G tube for feeding and we are going to begin bottle feeding again and she is off the oxygen. Her mother tells their story of their princess Gabby. She also works for an OBGYN as a nurse and hands out GBS brochures that she has gotten from GBSI. To learn more about Signs & Symptoms of GBS Infection, click HERE.